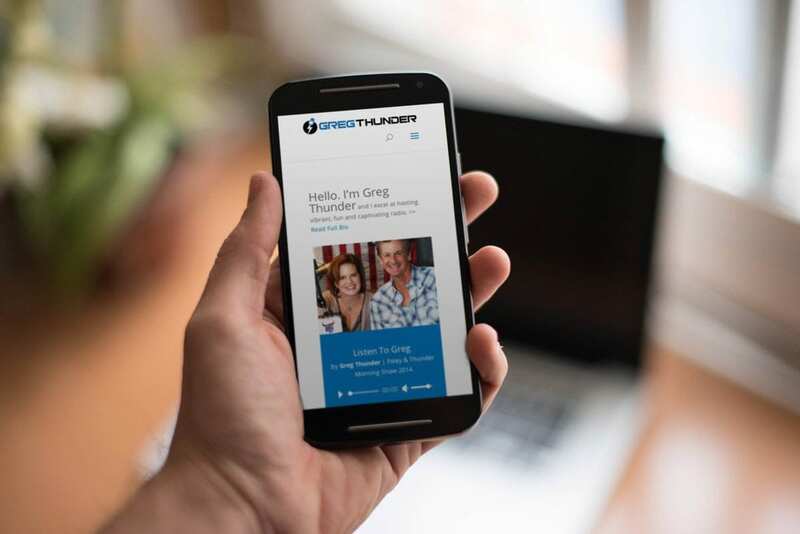 Greg Thunder is a veteran on air personality and morning show radio host. I had the pleasure of working in the broadcasting industry for 10 years so when greg came to me with an idea for his personal website it was like a dream come true. Greg wanted a quick and presentable portfolio website up right away. Using Elegant Themes Divi was a perfect fit for this portfolio site and I alway feel like ET provides me with a nice clean “black slate” to start with but theres also quite a few options to spice things up if I need to. With this foundation know I would easily be able to create HTML5 audio players on the site and also have the ability to create “Audio Posts” with the seldom utilized “post formats” feature, so down the road we might even be able to integrate a nice gallery of audio files rather than one or two clips. In the 10 years I spent in radio I had always wondered why more of the personalities didn’t start their own websites, especially when they had a microphone broadcasting their names to thousands of people daily. As a radio host, having your own personal website is a must. Unlike many of us they already have a huge platform to promote their own brands and personal ideals to a much wider audience than your average person and that gives them the opportunity to really grow their personal brand quickly.